In my last post, I was seriously feeling “blah” about creating anything new. 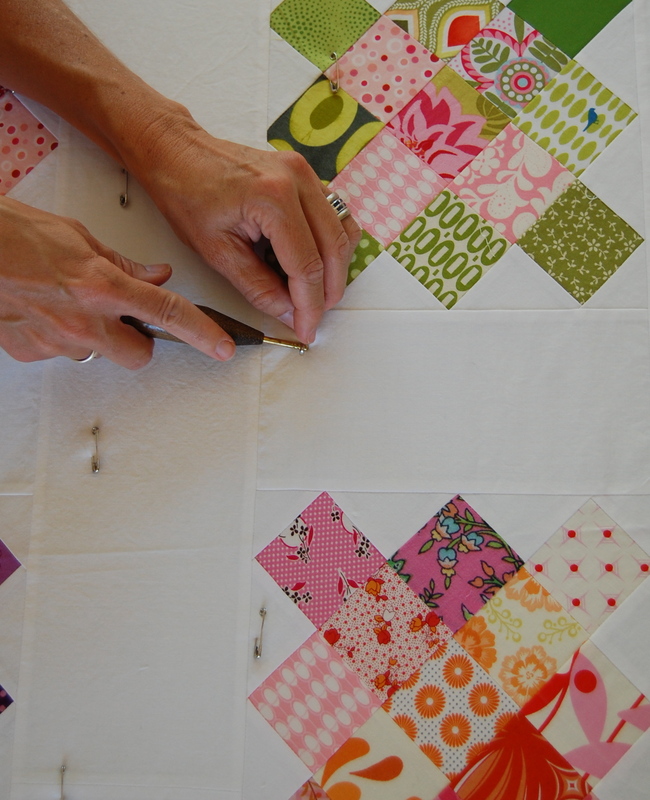 I finally figured, what better time to do the hard yet non-creative work of basting a large quilt! So I got to work with granny!! This is a great weekend activity for me as my girls love to be present for this but the hubby is also around to intervene when they get a bit too…… present, shall we say! Basting is usually when I contemplate my quilting lines, and for this quilt I’m pretty sure I’ll just do a basic stipple. I could use some practice with my FMQ foot anyway and with all the straight lines in this quilt, I figure it would be a nice girly, soft touch. This one will be for my oldest daughter, Miss K ‘s bed. It’s my first twin size quilt so I’m a bit nervous about getting it under my machine. But more excited to see the finished result!! 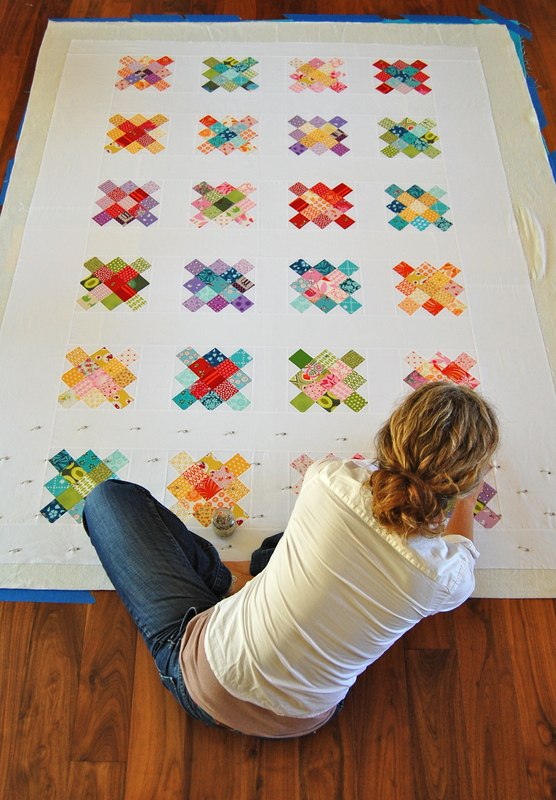 I’ve seriously thought about hiring a long arm quilter to baste large quilts for me, and I just might. I find this extremely difficult to do well, to end up with a truly smooth back with no wrinkles/puckers. You don’t seem to have that problem. How does your back feel after pin basting such a large quilt? It’s going to be lovely! I’ve got a friend who does most of her quilting on this little tiny Janome ~ always amazed at what she turns out! Karen, my thoughts are with you! 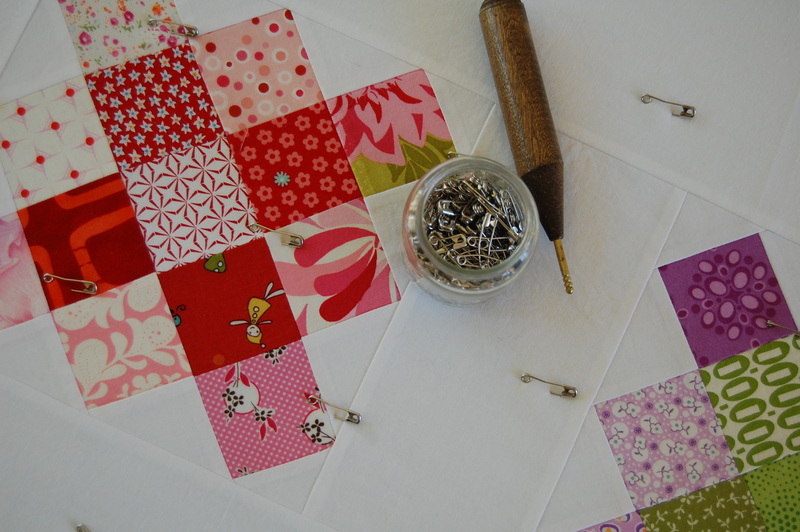 It’s a beautiful quilt top and it will look even prettier when it’s done. I haven’t made a twin size quilt either and putting off my large size top’s basting, but I think tomorrow will be the day 🙂 Good luck with the quilting part! How long did it take you to baste? It’s beautiful! I love the blocks you put together, it looks gorgeous and I think stippling it will be so pretty. I’m excited to see how it turns out! This is wonderful! I am in love with granny squares and yours are just perfect! I know that “run out of mojo” feeling. I seem to run into it from time to time myself. You’ll snap back though! It’s beautiful, Karen! I hope it gives you a break to get back your creative mojo! You can’t go wrong with stippling.